As I sit writing this you could be mistaken for thinking that summer is here to stay as the sunshine is streaming through the window and there are glimpses of blue sky peeking through the clouds. However this week has certainly had more of an autumnal feel – jumpers have been on, pregrudgingly the heating was put on a couple of evenings ago and the duvet is back on the bed (this I love though as it is so cosy). I love autumn – the changing colours, the crispness in the air and an excuse to put on cosy clothes are perfect reasons to love the season. I find the autumn to be a more predictable season, British summers are more often than not slightly disappointing but at least once it reaches September and autumn approaches we know what to expect and are rarely disappointed, occasionally we are even surprised by a late ‘Indian summer’. With an autumnal feel in the air this week and a few days at home with the hubby I decided a bit of baking was in order this weekend. Mr B was treating me to a delicious dinner and I though the least I could do was treat him to his choice of pudding in return. His favourite type of pud usually involves something that includes apples and as I did not have the inclination to make pastry I decided to go for an Autumnal Apple & Cinnamon Crumble Cake. 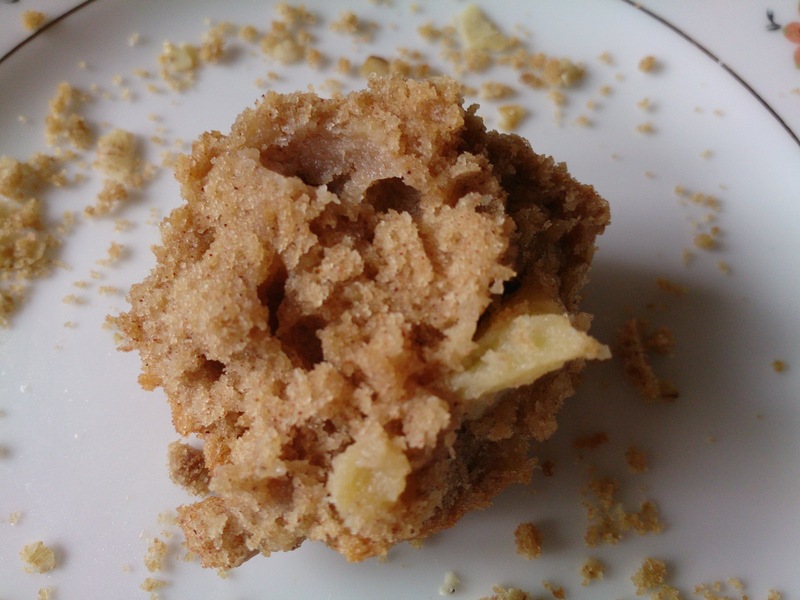 After a bit of searching online, I found a recipe on the BBC Good Food website for an Apple Crumble Loaf. However, being a bit of a baking maverick, I did not stick religiously to the recipe and made some adaptations of my own. With online recipes I always think it is sensible to take note of what other people think of the recipe and any advice they can offer. As Frances over at Frances Bakes discussed on her blog last week some recipes online are not reliable and, unless you have experience on your side as a baker, you can be left disheartened and disappointed when poor instructions lead to a poor outcome. I therefore always check the ratings a recipe has been given and take a glance at the comments from other people who have used the recipe. The main advice from multiple comments was to cook it for longer and to increase the spice level. I do consider myself to be a fairly experienced home baker and will generally make a few little tweaks to a recipe if I feel it is necessary, so when I had glanced at the ingredients list I had already decided that 2 teaspoons of spice in a 2lb cake would definitely not be enough. Also the cake only asked for mixed spice but, as many of the other bakers had also noted, cinnamon is a much better partner for apple so with this in mind I doubled the amount of mixed spice and added the same amount of cinnamon to the recipe. I am also not really a fan of adding milk to a recipe unless absolutely needed and so decided to add an extra apple and a banana (for sweetness) to the mix. Finally, for the crumble topping I substituted the suggested chopped hazelnuts for some rolled oats to make a crumble that resembled my Mum’s homemade classic. 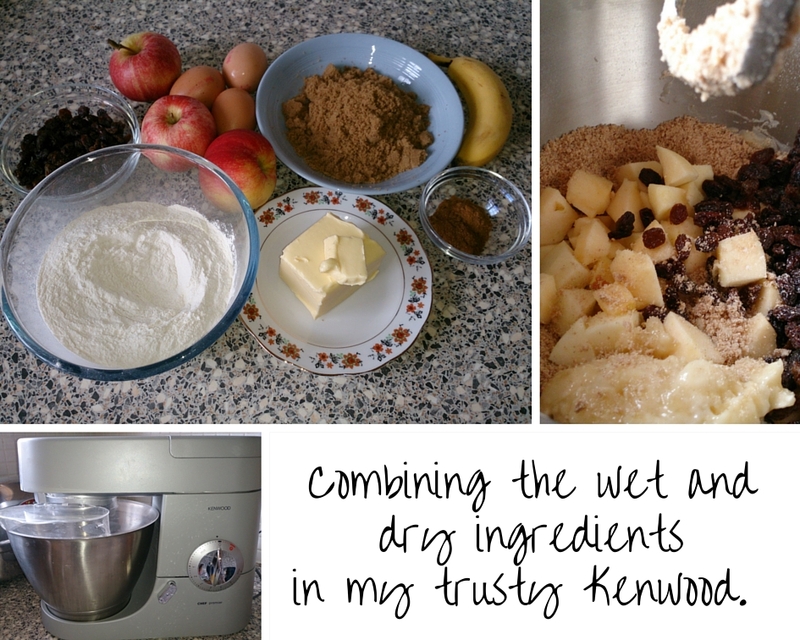 The recipe came together fairly easily in two easy steps, combining dry ingredients and then adding the wet. With the addition of the extra apple and mashed banana the consistency of the cake was perfect but I could definitely see why it would need the extra 20 mins cooking time as it is a fairly dense but moist mixture. When making the crumble mixture I made the decision to double to amounts as it did not seem enough to cover the cake, however when it came to it an increase by only a half again would have been fine and this is what I will do next time for sure. Somehow with every recipe designed for a 2lb loaf tin I always seem to be left with a bit over (I think my tins are not quite 2lb perhaps) which suits Mr B perfectly as he always likes to have a taster as soon as possible. 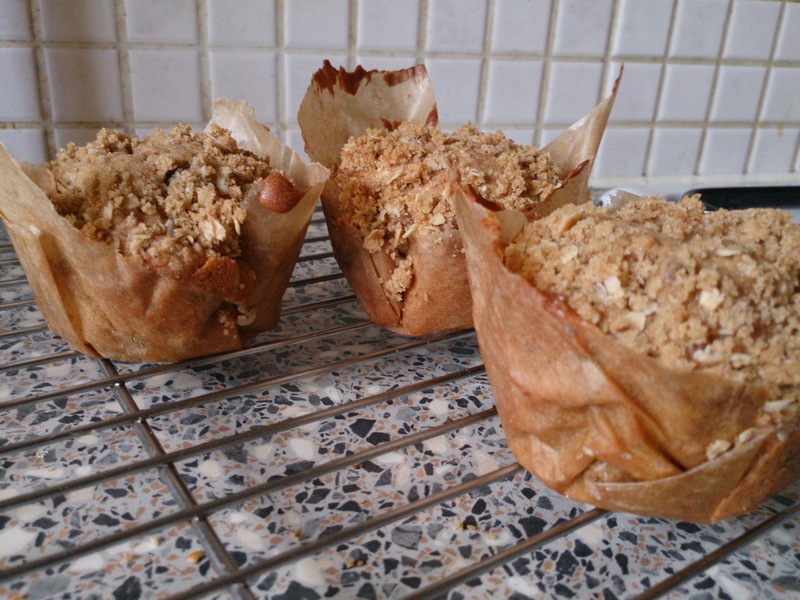 This recipe left me with enough to make an additional three muffin sized cakes, however finding I did not have any muffin cases (they seemed to have been eaten by my kitchen cupboard! ), I quickly made some make shift cases out of greaseproof. I was unsure of how the cakes would fair in these cases but they actually came out pretty well and unless it’s for a special occasion I might not bother with cases all the time from now on. The fact that our tasters only took half the time to cook, due to their smaller size, suited Mr B perfectly and we soon enjoyed tucking into them with a cup of freshly brewed tea. The finished cake was really delicious, it had a good rise and the fruit was well distributed (Paul and Mary would be pleased!). The apple and cinnamon combination made it a perfect autumnal bake and the more traditional crumble topping gave it a satisfying feeling of part cake/part pudding which means I think it would be perfect served with custard or ice cream if having it as a pud but just as good with a cup of tea like we did. It’s lightness from the rise and the moistness from the fruit made it really moreish and the only reason there was some left on the day of baking was because Mr B’s delicious dinner filled us up. 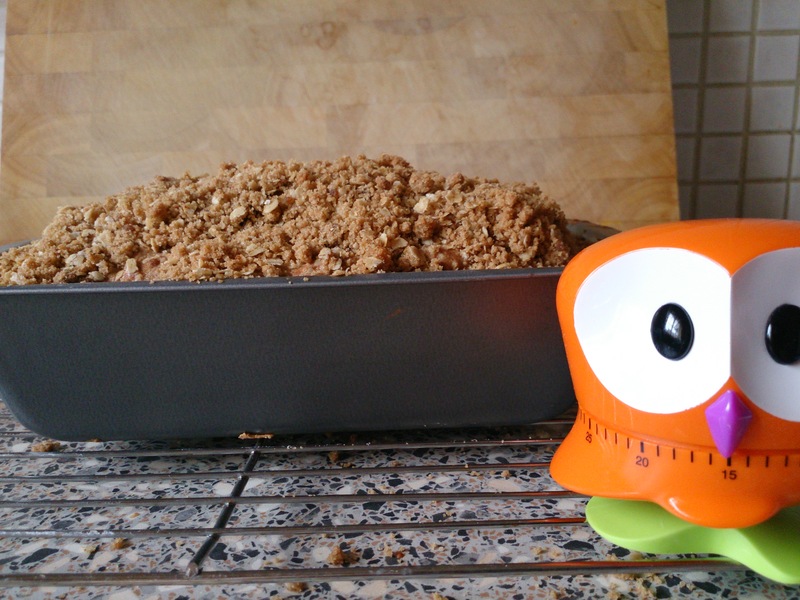 A tasty morsel of this yummy autumnal cake – it didn’t last long! Butter and line the bast of a 2lb loaf tin with greaseproof paper. Put the flour and spices into a food processor and add the butter – whizz to fine breadcrumbs and then add the sugar (if you do not have a food processor use your fingers to make a fine crumble). Add the raisins, beaten eggs, apple and banana to the dry ingredients and mix well until everything is evenly combined. Spoon the mixture into the prepared tin and smooth the top. 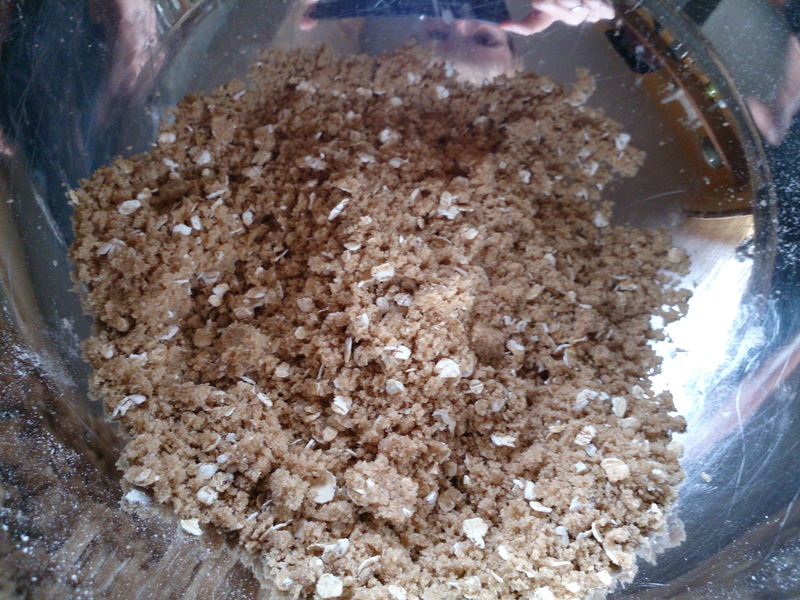 Rub the flour, butter and sugar through your fingers to make a rough crumble, then stir in the rolled oats. Sprinkle evenly over the cake mixture. Bake for 1 hour and 10 mins, until firm to the touch and a fine skewer in the centre comes out clean. Cool in the tin for 15 mins, then turn out and cool on a wire rack. 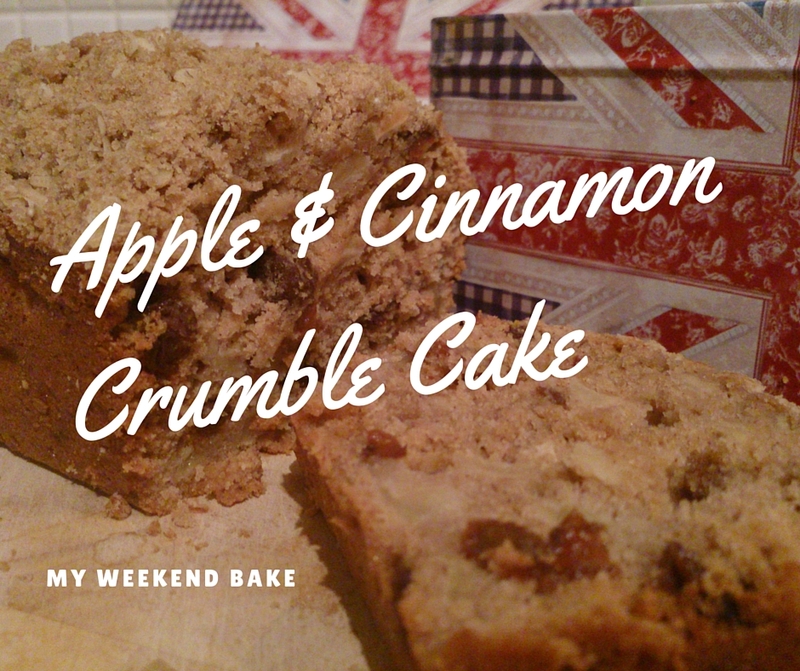 This will definitely be a recipe I return to and it met Mr B’s approval for an apple based bake so that’s a winner for me! I am looking forward to more adventures in the kitchen during the Autumn months, I think blackberries might be next on the agenda. I love my sewing machine, over the summer I have used it almost everyday and each time it has been a joy to use. After learning to sew last year my passion for this hobby has grown and after some careful research I decided to purchase my own machine in March this year (I had been using my Mum’s machine) and opted for the Janome DKS100, a computerised sewing machine as recommended by Tilly over at Tilly and the Buttons. I cannot praise this machine enough, it has been perfect for me so far and today I wanted to share my love for my sewing machine with you. It’s beautiful – this may seem like a strange thing to start with but I cannot say how satisfying it is to take the protective cover off and be greeted by its cheery bright blue keypad and sleek design – I love it. 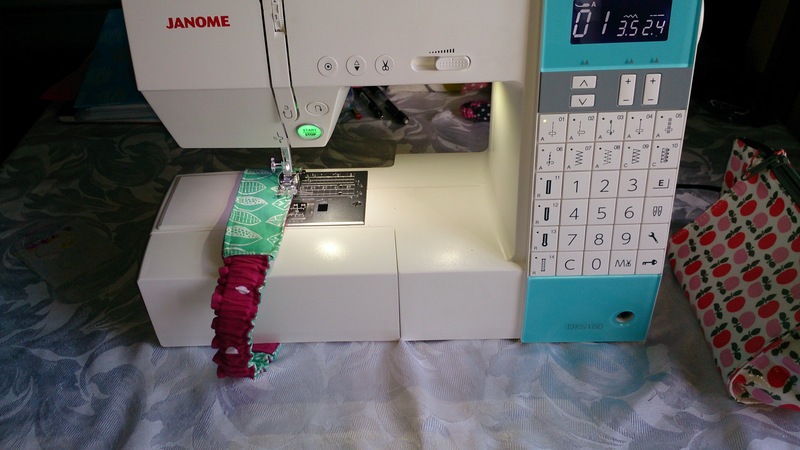 It lets me be a sewer – this may seem like an obvious thing to say but the nifty time-saving gadgets on this machine let me start sewing in a fraction of the time I have experienced with other machines I’ve used. It has buttons for an automatic thread cutter, thread knotting and needle up/down position which not only make sewing easier they have also helped to make my finished pieces neater. It doesn’t need a foot pedal – this is a controversial point as some sewers find sewing without a pedal disconcerting however, I decided when I got my machine to exclusively use the start/stop button and speed slider rather than the foot pedal. I have found this has become second nature, the start/stop button is placed appropriately so it is easy to use and the speed slider means there are no sudden changes in speed unexpectedly. It’s heavy – I could also see this as a disadvantage I suppose as it means I am unable to transport it very easily however, it’s weight means it is stable, particularly when sewing through multiple layers. It treats me like a numpty – by which I mean it prevents me from making unnecessary mistakes or put myself in unnecessary danger. For example, it recognises which foot is on the machine and if this is appropriate for the selected stitch chosen, if it’s not it won’t let me select the stitch unless I change the foot. It also has a handy ‘safe’ button which can be pressed to prevent machine from starting, even if the start/stop button is accidentally pressed. This is particularly handy when threading the needle. It has some very cute stitches – the machine comes with the capability to use approximately 100 stitches (most of which I haven’t used yet), including basic stitches, simple embroidery, quilting, button holes and more. 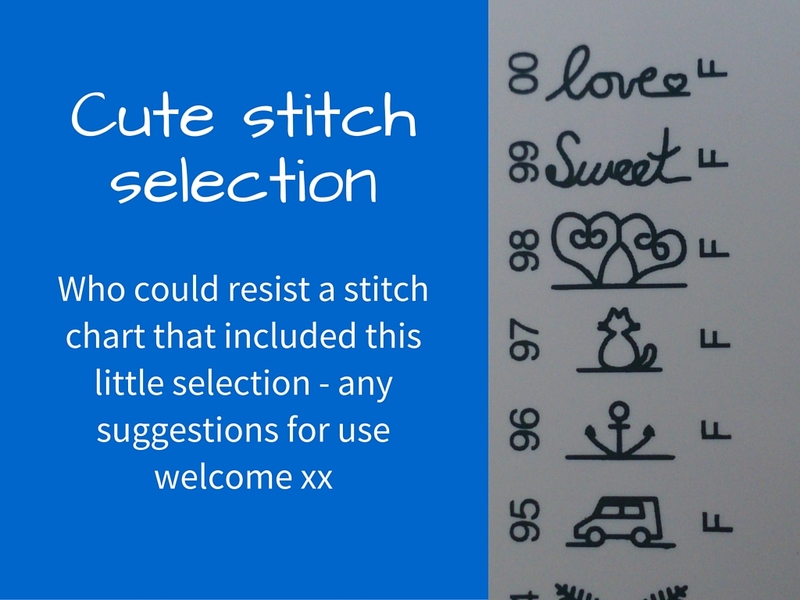 The best ones of all are the cute embroidery stitches which I can’t wait to use to finish a project or two. 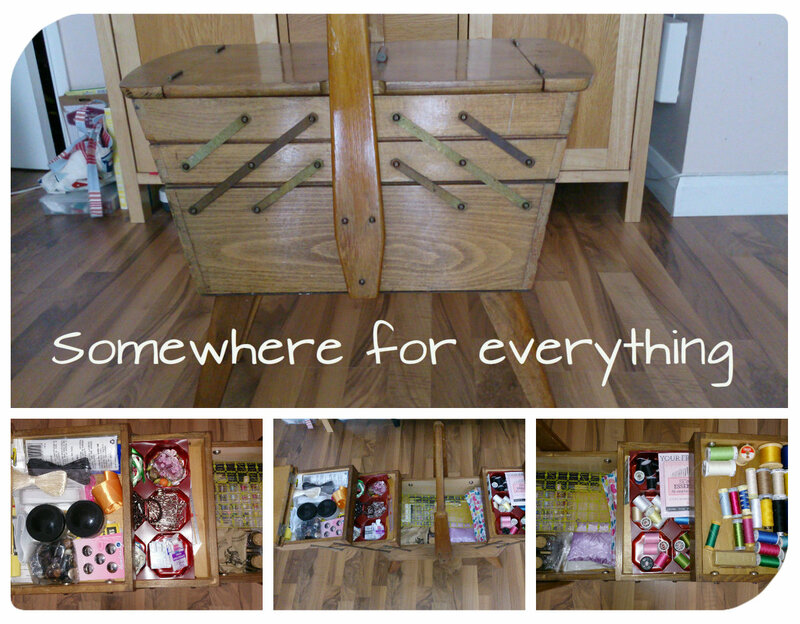 It has a lovely best friend in the form of my super sewing box – the organisation of my sewing bits and bobs is awesome since I was bought this super sewing box by my husband for my last birthday, everything is in one place and it is handily placed right behind me when I am sewing for easy access. 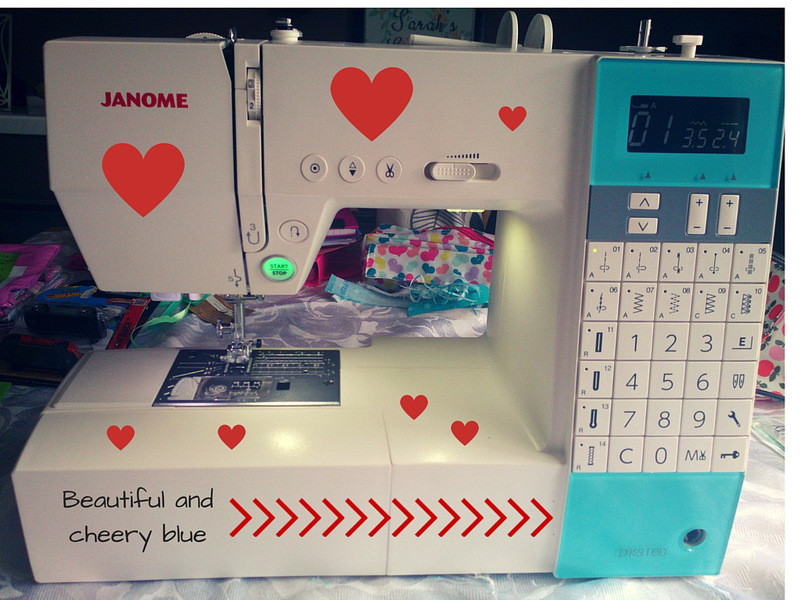 I have made some lovely things on it – this machine has given me confidence and in turn this has helped turn me into a better sewer which has encouraged me to sew more. In the months since I have had it I have really enjoyed using it and it’s ease of use has allowed me to create some really nice makes. 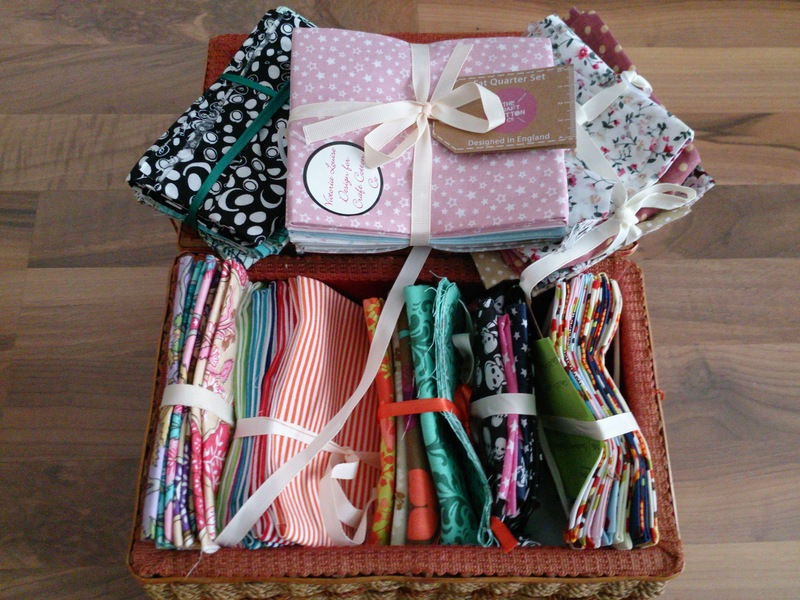 It has turned me into a crazy fabric lady – despite lack of funds I have still managed to accumulate quite a fabric stash, mainly in the form of fat quarter bundles which handily fit with my favourite type of make – mini makes and accessories. It will allow me to grow as a sewer – I purposely chose a machine that I could grow into, I am really looking forward to learning new techniques on this machine – I am yet to brave zips or button holes but they will be on the agenda soon or else everything will be poppered or Velcroed together for all eternity! As you can see I really do love my sewing machine, it hasn’t at present given me anything to complain about and I can’t wait to become an experienced sewer using it. Disclaimer: the opinions in this review are my own, I was not asked to write this review by Janome and I purchased the Janome DKS100 myself. 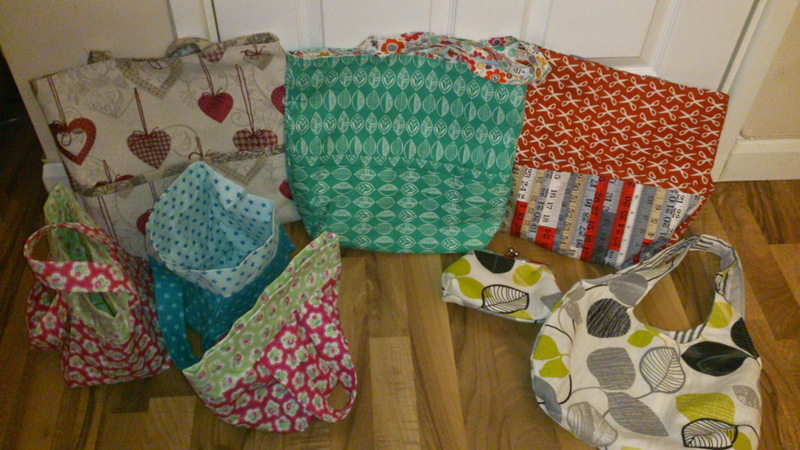 This week’s crafting has been mainly about taking note of the old adage described in the title of this post as I have been busy designing and making a range of mini-totes. 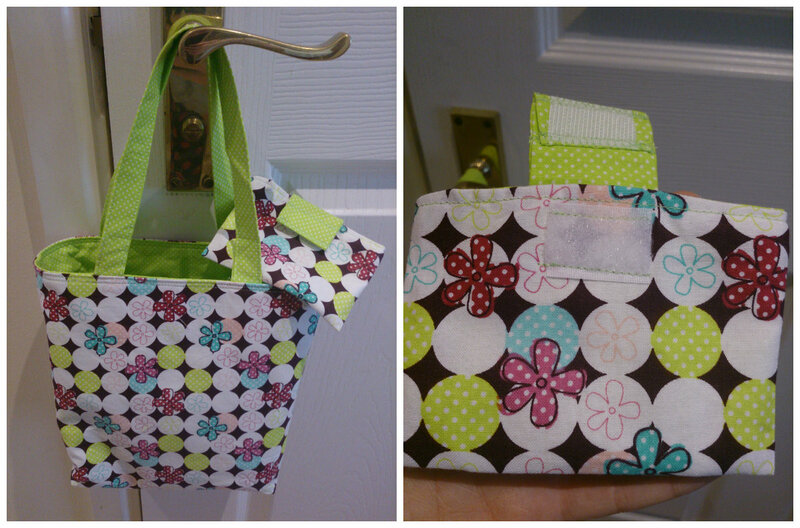 The story of these mini-totes starts with a slight obsession I have developed recently with fat quarter bundles. There is something so appealing about a set of complimentary fabrics bundled together ready to be made into whatever takes your fancy. These bundles can be bought quite cheaply from most places you’d normally get fabric and provide a perfect excuse for creating mini-makes (my favourite kind of make of all). Whilst perusing my selection of fat quarter bundles one evening I had the idea to make a mini-tote based on the one I originally made when I learnt to sew. 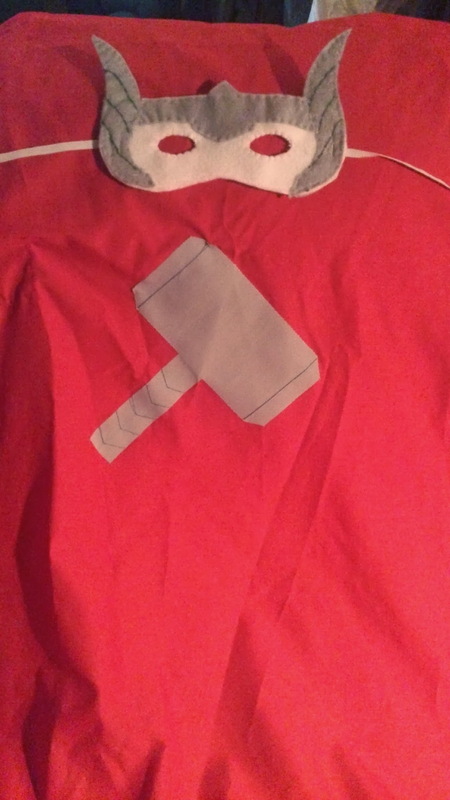 Having never adapted a pattern before I decided to dive straight in and resize the measurements so that they would fit a fat quarter piece of fabric. This took a bit of jiggery-pokery with the calculations (not my strong point) but eventually I came up with some measurements which would create a pattern which was about two-thirds the size of the original. 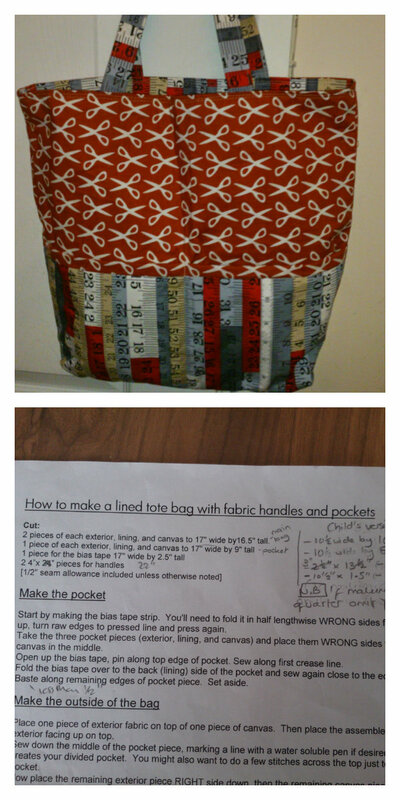 The original tote and pattern – with my added scribbles! 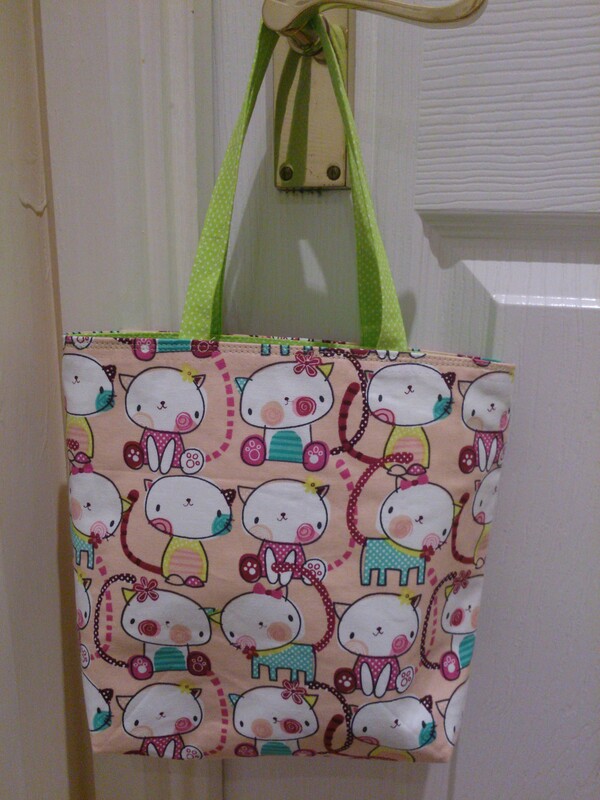 Feeling chuffed with myself for my lucky maths, I set about making the prototype mini-tote from some cute cat print and a contrasting green interior fabric. The thing I really like about this pattern is that it is has a wide base so that it can sit flat and not fall over when it has items inside and the fact that it is lined which gives it durability as well making it visually appealing with the contrasting interior. 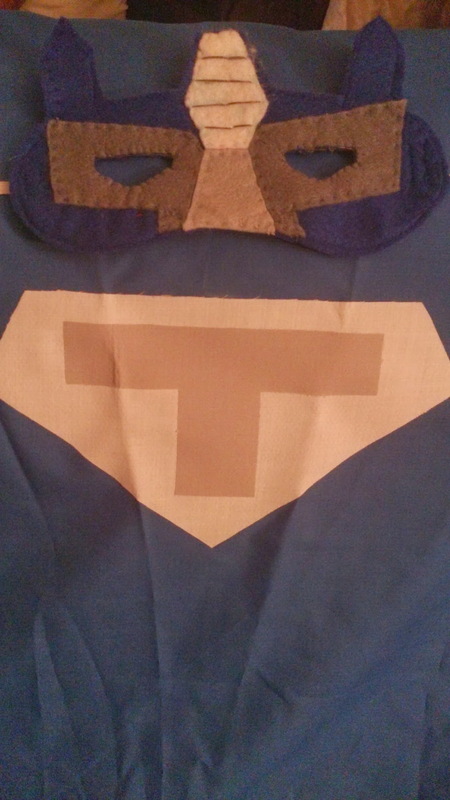 Adapting the pattern, cutting and sewing the fabric took me well into the early hours, however, it was worth staying up late as the prototype turned out surprisingly well. The only change which I decided I would make for mini-tote number two would be to widen the straps so their proportions matched the original version better. 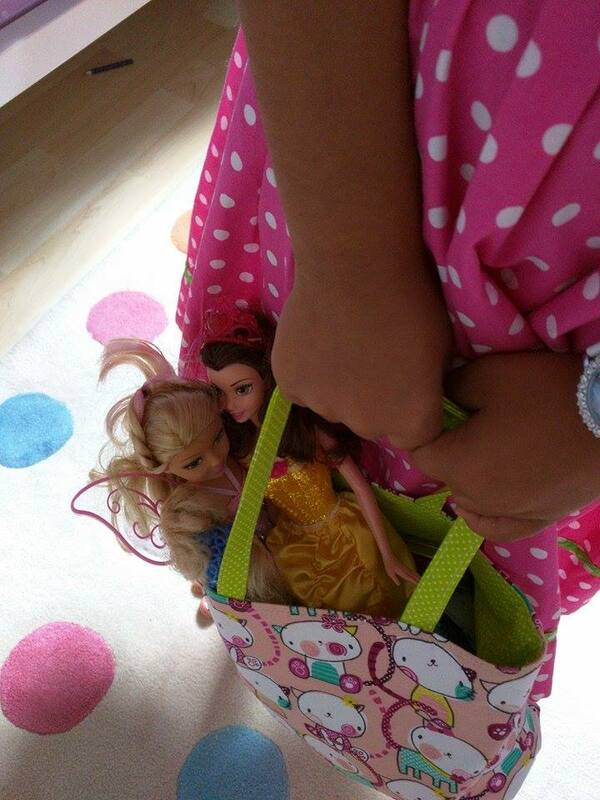 A perfect tester for my prototype was found in the form of my four year old niece who over the weekend ran it through it’s paces by filling it with all manner of girly items and taking it out and about with her. Whilst discussing this first make with my sister in law I decided that as well as widening the straps I would add an internal pocket to fit small items into. The original pattern for the larger tote included an external pocket, however, due to the restrictions of trying to fit the pattern onto a fat quarter sized piece of fabric this was not possible on the scaled down version so, for this reason as well, an internal pocket also seemed a good idea for the mini version. 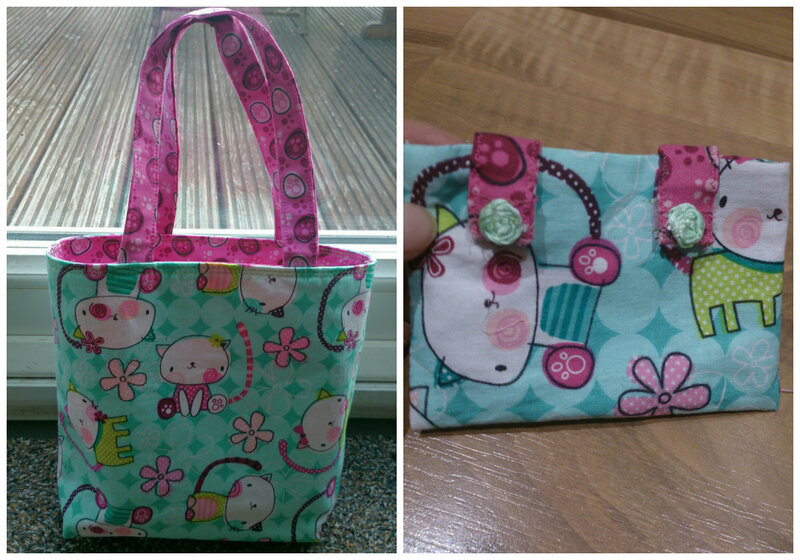 The next day’s sewing involved designing and creating an internal pocket and adding this to mini-tote bag number two. By a happy accident, I was also able to create a small purse from a wrongly sized first attempt at a pocket (I forgot to add a seam allowance). The purse is definitely a work in progress and may be the next project I work on. 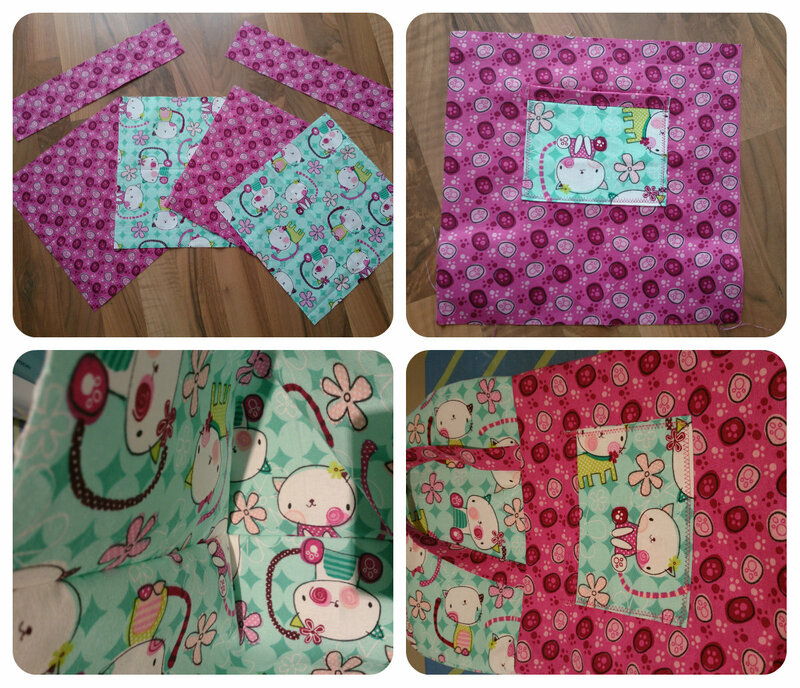 I have since gone on to make two more mini-totes from the same fat quarter bundle (and intend to make one more this weekend) as well as another purse, plus a pink and black version using some fabric from another fat quarter bundle. Which is your favourite mini-tote? 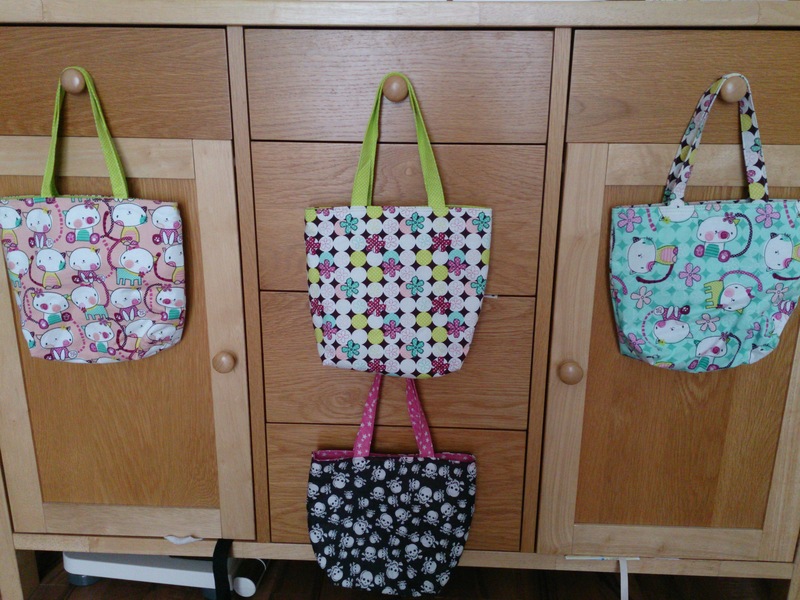 I have really enjoyed making these mini-totes and feel proud of myself for managing to overcome some difficulties I faced and for successfully adapting a pattern (thanks goes to Janet at KitchenTableSewing for the original). My mini-tester certainly enjoyed using the prototype and has since become the recipient of the new improved version with internal pocket and matching purse, much to her delight. 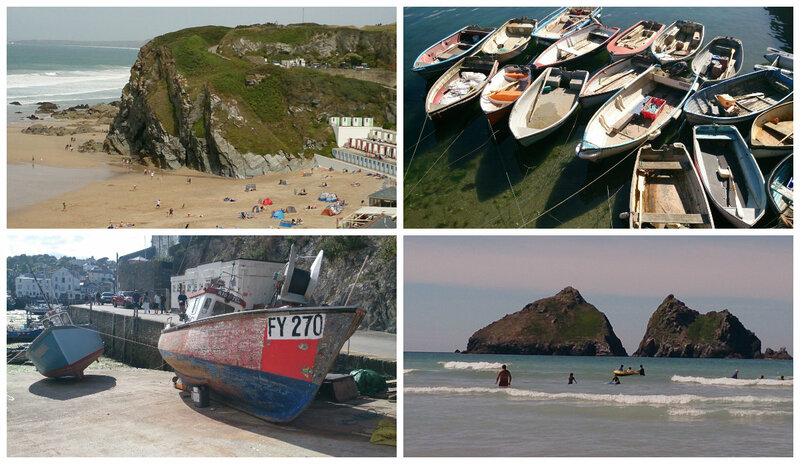 I have recently returned from a wonderful week in Cornwall, staying at Trevornick Holiday Park. Whilst Mr B and I were away we enjoyed celebrating my Dad’s birthday with him. I was particularly looking forward to this day in our holiday as I couldn’t wait to give him my gift. 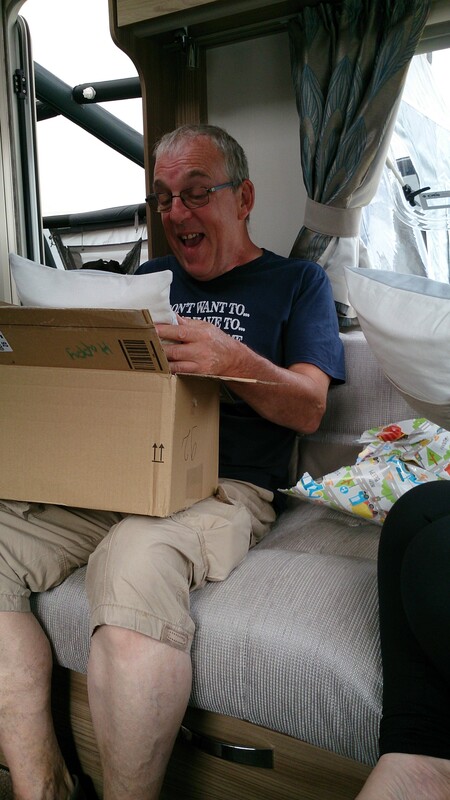 My Dad has recently bought a shiny new caravan and has been enjoying his retirement exploring the beautiful countryside of Great Britain having some very relaxed weekends away and short breaks. I therefore decided that a holiday/caravan themed present would be perfect for his birthday this year and after my wonderful time learning to free motion embroider with the lovely Cathy of Dear Emma Designs (read about it here), I have been itching to create more pieces of textile art and this seemed like the perfect reason. Something I found I really enjoy with free motion embroidery is spending time designing and developing an idea before creating a piece. 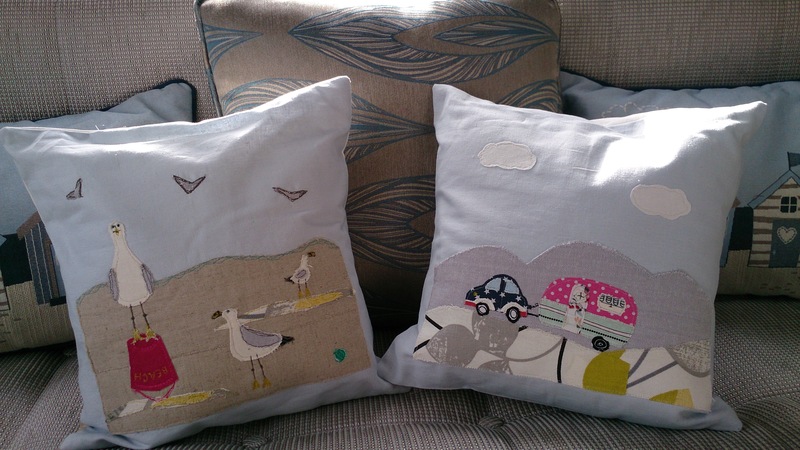 With my Dad’s presents I decided I was going to make two envelope cushion covers with free motion embroidery fronts, one with a seaside theme and the second with a caravan theme. 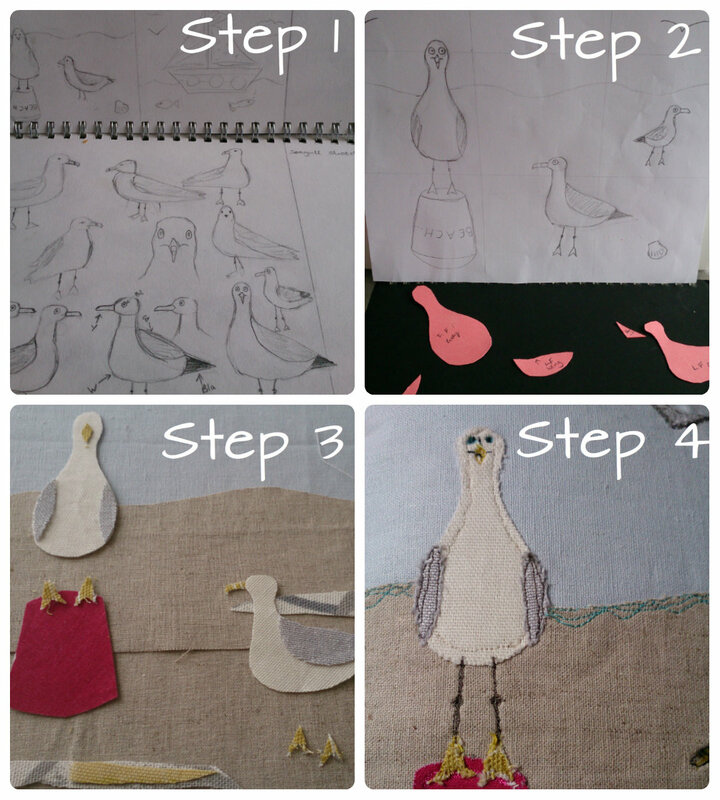 For the first cushion I initially sketched a few ideas of seaside themed scenes before settling on a seagull based image. I then spent a lazy Saturday morning looking at pictures of seagulls on Google to get to know them better and used these initial sketches to create more stylised seagulls with a bit more character for my final design. 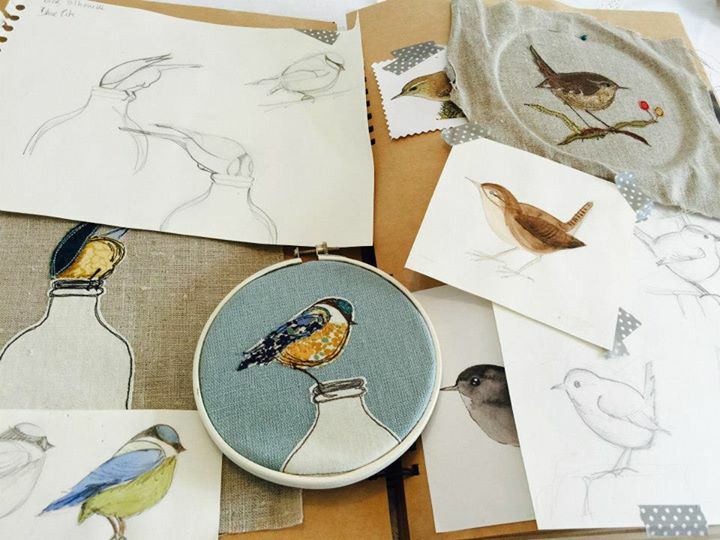 Although quite time consuming, it is so satisfying to build up the picture – taking time to choose the materials from my ever growing collection of scrap fabric, create templates to cut out the individual shapes and then finally layer and sew them with a variety of coloured threads. I am really pleased with the finished results and was so chuffed when I saw my Dad’s reaction when he received them. I know they have found a happy home in his caravan. Our break away offered lots of inspiration for more creative pieces with a seaside theme. 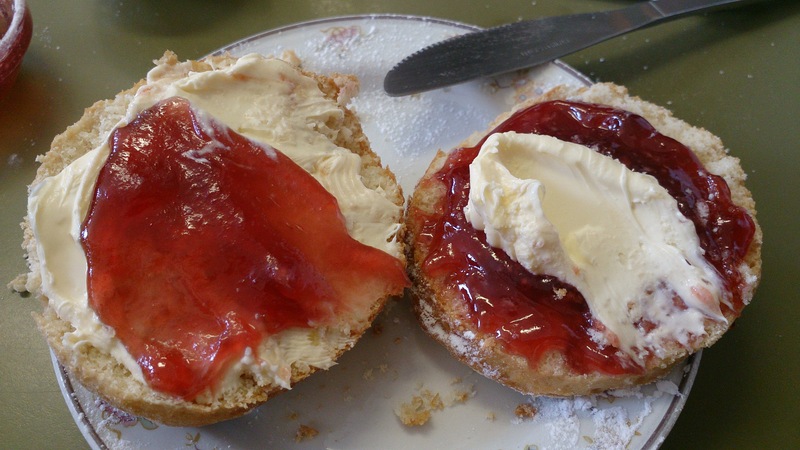 We enjoyed some beautiful sunny days exploring the wonders of Cornwall, visiting the stunning beaches and fishing villages and of course indulging in the obligatory cream teas and fish and chips. 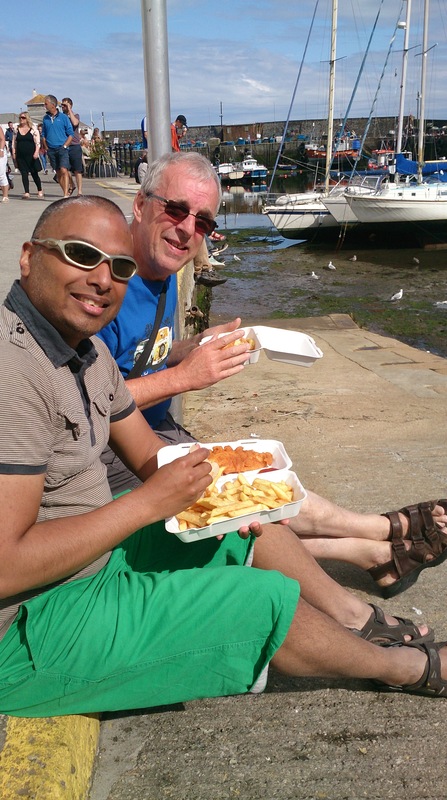 Nothing more delicious than freshly caught fish accompanied by chips – yummy! 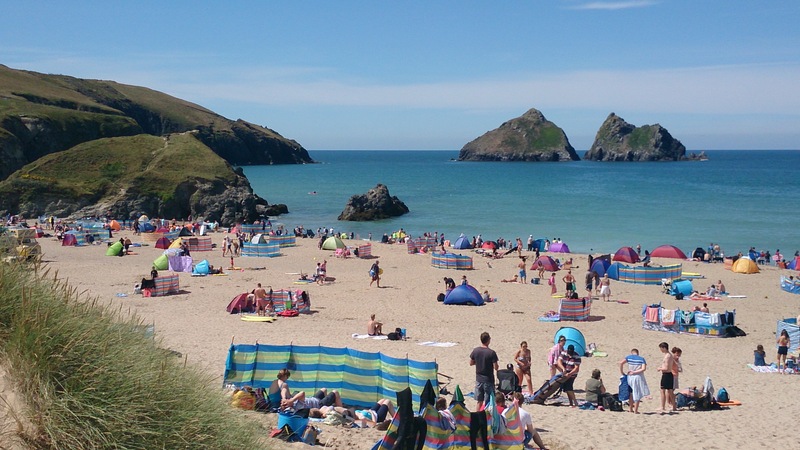 When the sun was shining it truly felt like we could have been abroad, especially when we visited the amazing beach at Holywell Bay which was literally walking distance from the holiday park we were staying at. Unfortunately all good things have to come to an end and so after a lovely relaxing week we returned to the slightly less sunny Bedford. The only recompense for the post-holiday blues that will inevitably descend upon us is that my sewing machine is now close at hand ready for me to create some more seaside inspired pieces – I can’t wait! 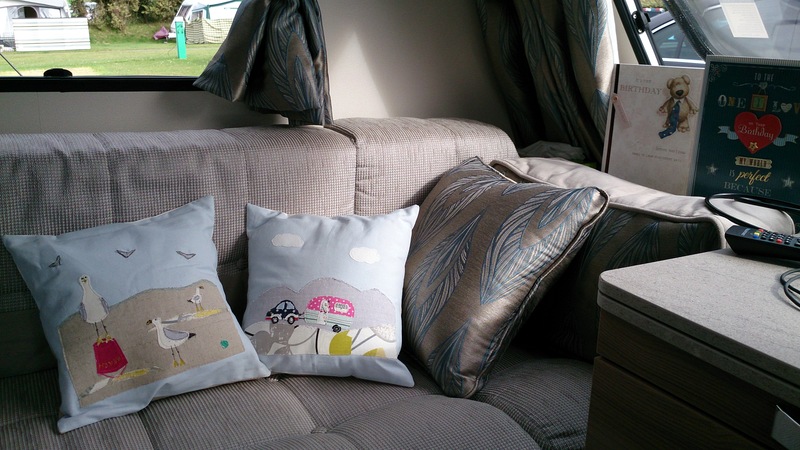 Have your summer time jaunts given you crafty inspiration? As a teacher, I have two beginnings each year, one in January and one in September. These mark two new fresh starts for me and although I am not a person who particularly believes in making new year’s resolutions, on occasions these times in the year do encourage a flurry of action in me, particularly if I have an ambition in mind. The last time this happened to me was back in the new year of 2010 when I signed up to the dating site OKCupid and by January 2011 I had met and moved in with Mr B, my lovely husband. 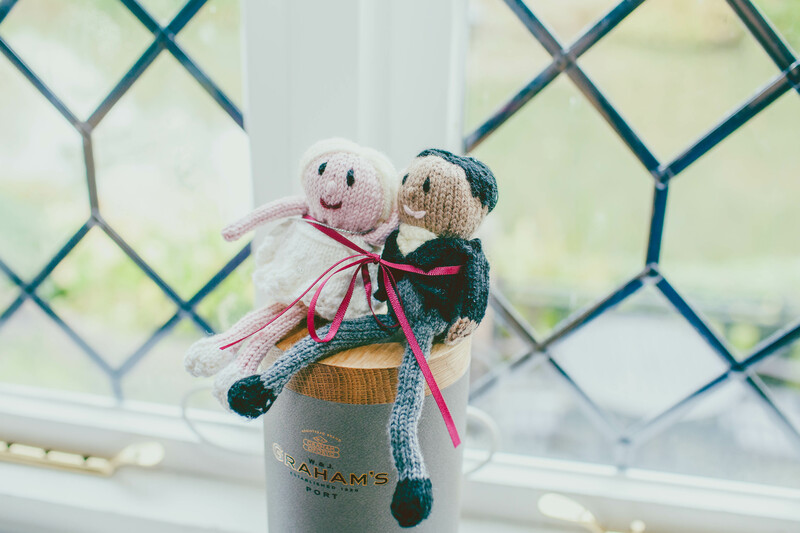 Unsurprisingly a handmade knitted version made an appearance on the big day! It was in September last year, in another flurry of action, I decided this was the year to start on a new journey and expand my crafting skills in new directions. Since then I have embarked on a busy year of learning and have met some really lovely people along the way. 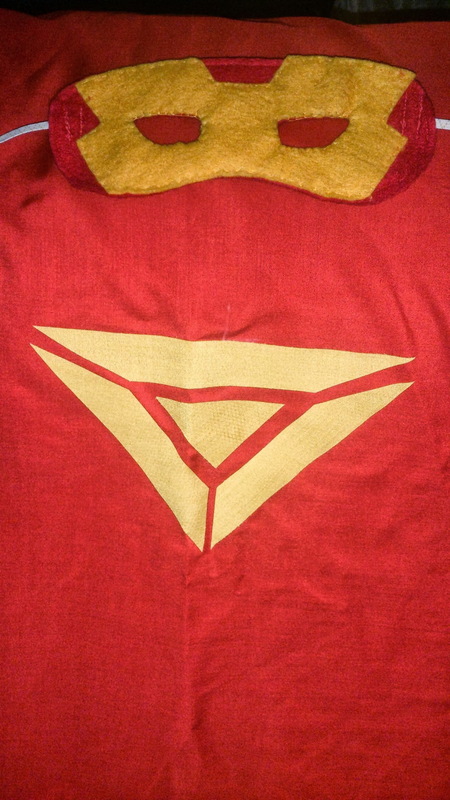 Can you guess which superheroes they represent?? 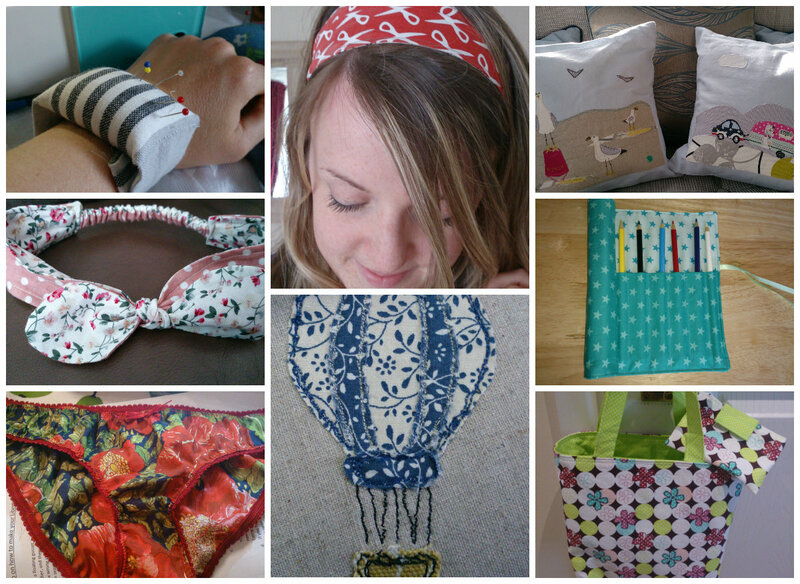 As usual once the I had been bitten by the bug it was hard for me to stop so inspired by my success on the beginners course I proceeded to create at least 75% of my Christmas presents for friends and family using the sewing machine and learnt a couple of new patterns and processes in the progress. 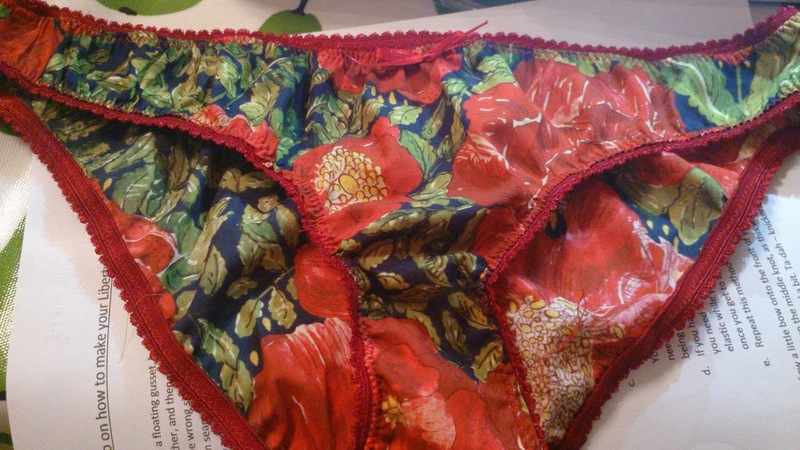 I have since returned to the kitchen table for more cakey yumminess and, of course, sewing guidance from Janet, attending two more of her courses, making my very own Coco from the Tilly and the Buttons pattern and a pair of fancy knickers using some fantastic Liberty print fabric. 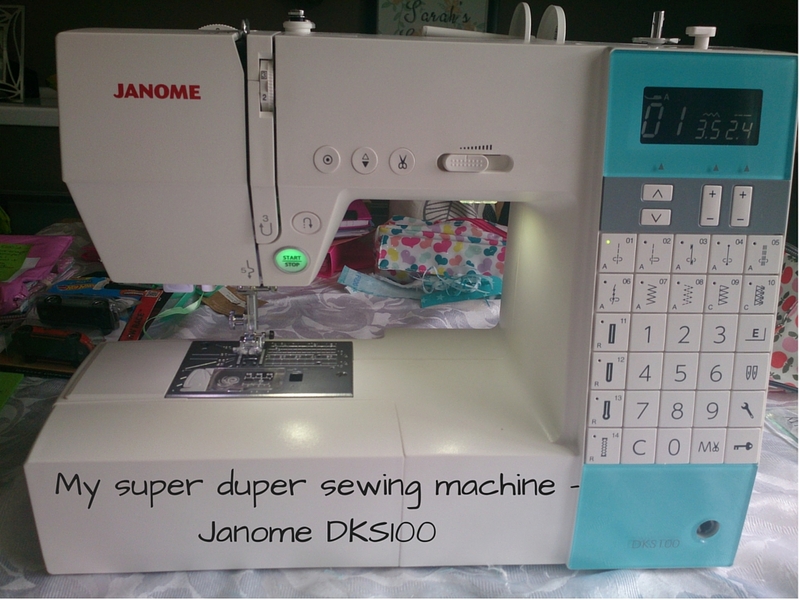 I was also inspired enough to buy my own machine, a super duper Janome DSK100, which has made my sewing experience so lovely and saved a lot of time with its numerous nifty time saving gadgets. As the New Year approached I decided that my next skill to master would be needle-felting. 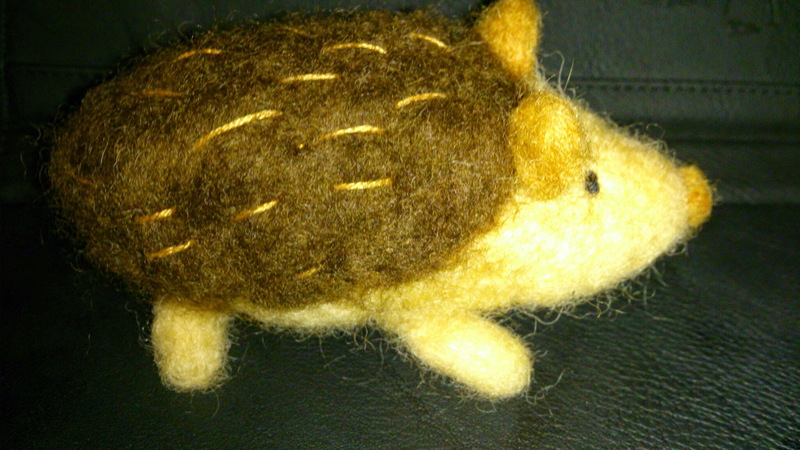 This was a skill I felt I could teach myself (perhaps with a little help from the internet) and so bought myself a kit to make a felted hedgehog from Hobbycraft. 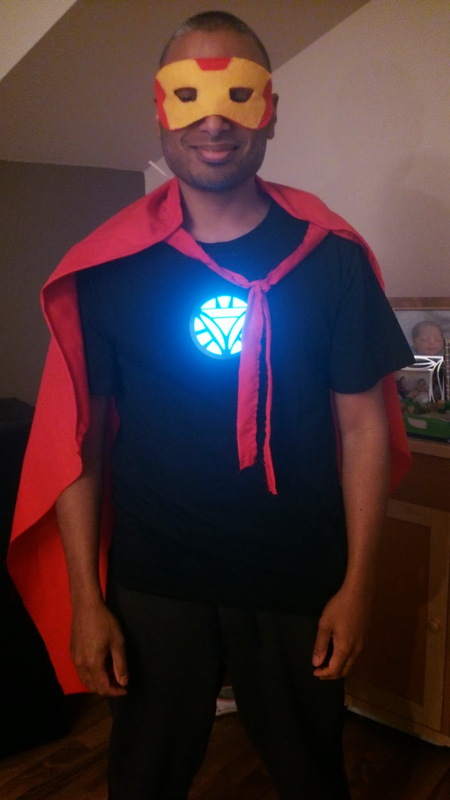 Although little Wimpole, as my nephew and niece soon Christened him, was a bit rough around the edges I was pretty proud of my first attempt at this new skill. 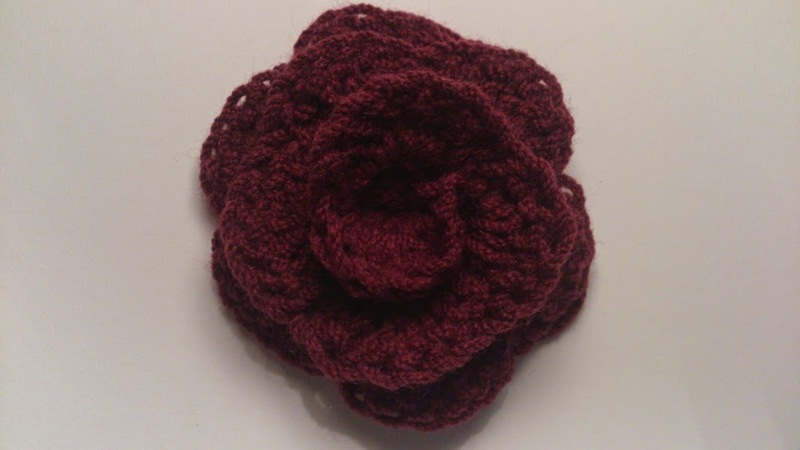 Next I tackled what had become, as a seasoned knitter at least, my nemesis – crochet! It has always appealed to me but when I have attempted it previously I have found that my knitting technique has worked against me. Professional help was definitely needed. So on a wet Wednesday evening in March I travelled to Hitchin to a recent yarn discovery, the fantastic Knit Knacks shop, and settled in for an evening of wool and hooks. In the company of three other crochet novices and with the assistance of resident expert Helen Ingram who runs Woolly Chic, a fantastic website selling hand sourced British wool and crochet/knitting kits, I finally got through my hook block and managed to produce a lovely crochet flower by the end of the evening. In these few hours my wool nemesis had become an ally to its much loved knitted friend. The final destination on my crafting journey involved travelling the longest distance yet as I signed up for a workshop at Needle and Thread (near Lincoln) to learn how to create textile art using applique and free motion embroidery with the very talented Cathy Emmott of Dear Emma Designs. I have always admired this kind of needle work and had been searching for a workshop to attend for a long time so was so pleased when I came across this gem. 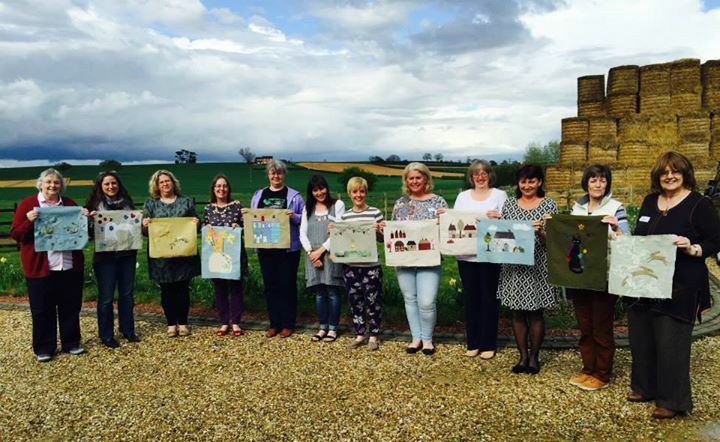 Over a busy six hours Cathy inspired and assisted a lovely group of twelve crafty enthusiasts to become novice needle and thread artists. This was a fantastic conclusion to my crafty year and definitely worth the four hour round journey! 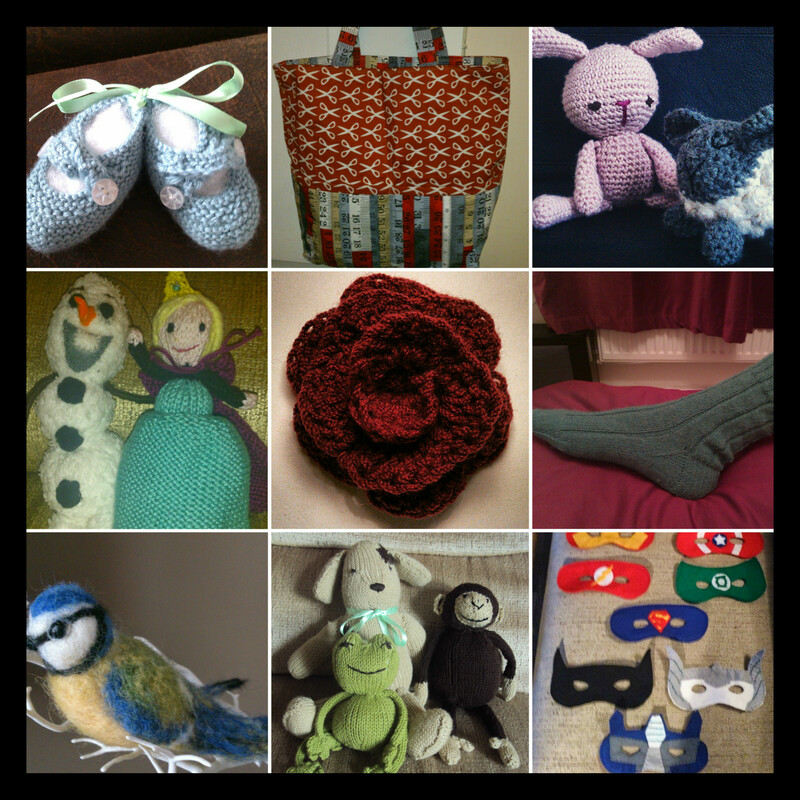 The last twelve months have certainly been busy and I have really enjoyed learning new crafting skills. I wonder what the next twelve months will hold for me. 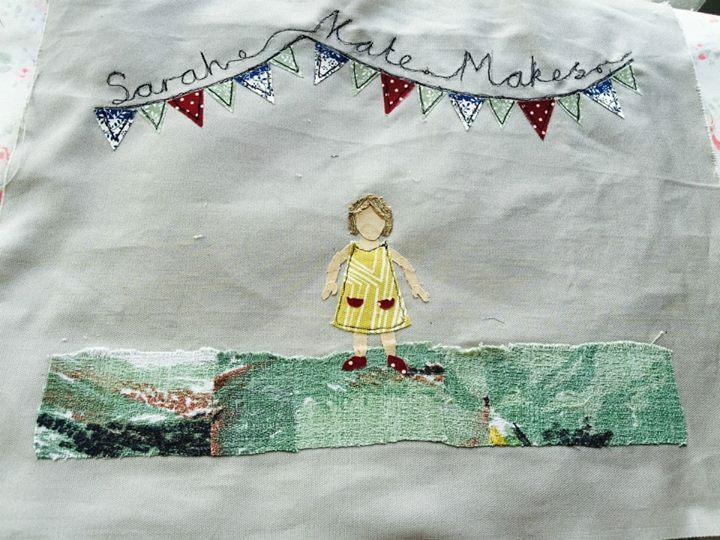 It has been an exciting week for me at sarahkatemakes headquarters, as well as joining the friendly ‘bloggersphere’, I have also become a tweeter, something which I am not sure I am ready for but which I am optimistic about having a go at. I am hoping my new blogging buddy Lucy, at mrsbishopsbakesandbanters, might be able to offer some useful advice as she seems to be a social media queen and is definitely a very friendly blogger with an amazing page. As you might expect I have been mentioning my new blog to all who will sit still enough to listen or at least read a Facebook message sent by yours truly. This included my quite untechnological Mum; knowing she wouldn’t have seen it via any social media I made sure when I popped round to her house to take my tablet and share it with her that way. Once she had finished reading it and given her feedback (thankfully positive). She offered to return the Polly Dolly to me who has sadly been living in a drawer for the last decade or so. As you can see she is a strange looking individual and things just get a bit stranger when you lift her up and see the stuffing falling out or take down her hat and see her balding head (sadly or perhaps thankfully, I took no pictures of these features). 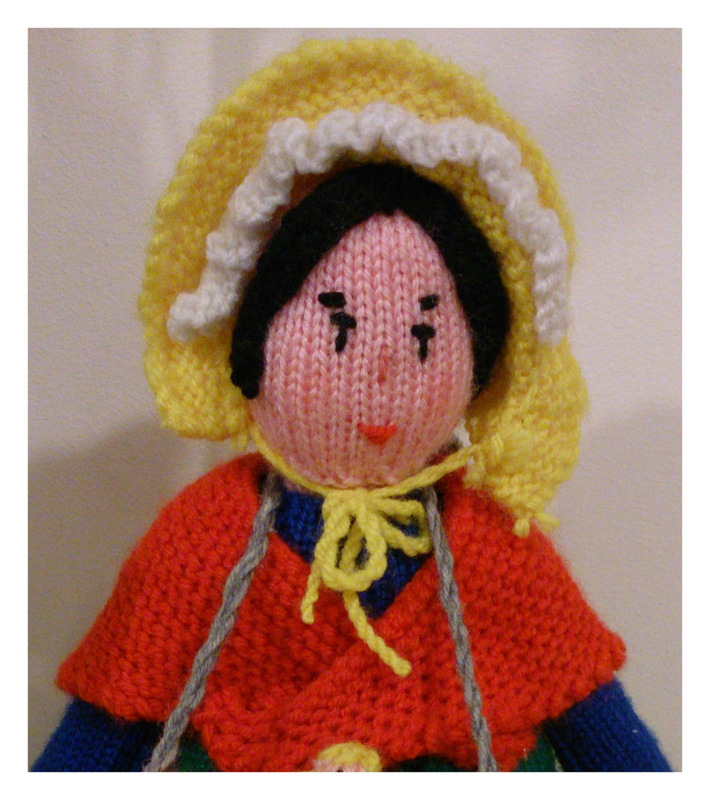 She was definitely an interesting choice for my first proper knitting project. She allowed me to practise a number of handy techniques including increasing, decreasing, colour changes and making miniature items (as seen in her peddler’s basket), all of which I have applied many times since. I’ve always had good tension with my knitting and this certainly suited this make. Adding to this my tendency to be a crafting perfectionist meaning that whatever the purpose of the final item I won’t say it is finished until I think I’ve done it to the highest standard I can achieve. Despite her unique features I have to say I am quite proud of how she turned out. Polly was the beginning of my love affair with wool and it was lovely to be reacquainted with her, however she has become quite comfy in her new home so she has been returned to her drawer at Mum’s house. Perhaps one day she’ll find a nice comfy spot in my dream craft room and I’ll finally give her top and bottom the finishing touches she deserves so she can have pride of place. It’d be great to hear where it all started for you, what was your first crafting make and did it have a specific purpose or was it a flight of fancy like Polly Dolly? I have always enjoyed making things, tinkering and creating loveliness with my hands has always seemed like the perfect way to spend my spare time. My crafty life started with Knitting Nancy. This was, upon reflection, a rather strangely named item as I don’t think that William and Kate ever had Nancy as an option for their newest addition to the royal family but for some reason it was deemed appropriate for this rather royal (and grumpy) looking crafting gadget for budding child knitters. Much to my parents delight, it would keep me entertained for a least enough time for a cup of tea to be made or perhaps even dinner, as I sat winding wool round ‘Nancy’s’ royal crown to create a long knitted tail which magically emerged from between her feet. Keeping me entertained and quiet was perhaps it’s sole purpose as I don’t think I ever found a use for this neatly produced cord. Although Nancy may have piqued my interest I was ultimately inspired to take up knitting whilst watching my Great Auntie Vi’s needles moving at the speed of light creating ‘Vi-digans’ for the whole family, a snuggly cabled Aaron cardigan (or occasional jumper) which kept us all warm throughout every winter of the 1980’s. It was, at about the age of 10, under the instruction of our family’s knitting matriarch I first learnt how to knit however I then didn’t pick up the needles again properly until I was about 20 when my real passion for needlecrafts really began. 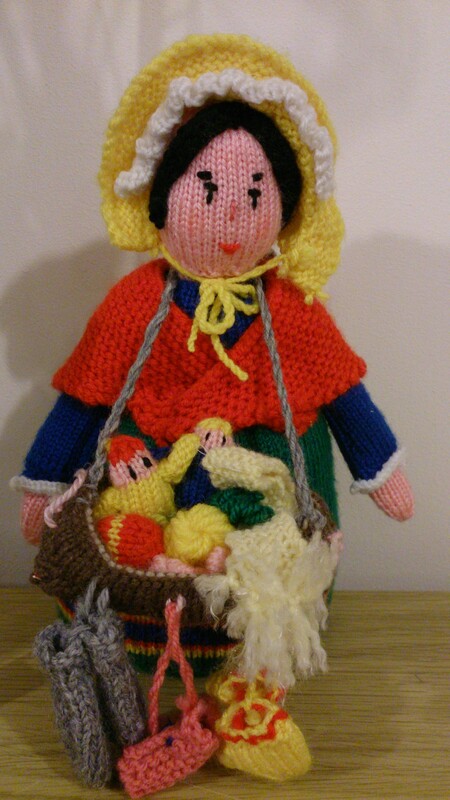 My first ever project, for reasons I can’t even explain, was to make what we soon christened ‘Polly Dolly’, a peddler woman doll carrying a basket full of items to sell. Since then I have dabbled in creating a variety of items but always seem to come back to small makes like toys and accessories which I enjoy as they are not only quick to make but I also find more interesting patterns to follow. 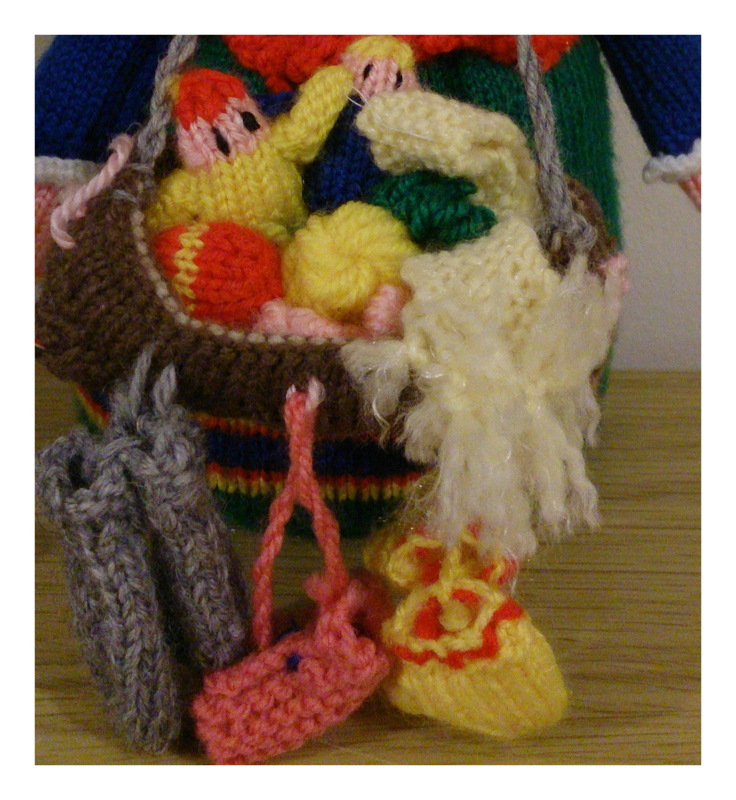 Since learning to knit, in recent years I have explored and developed my skills in a number of other crafts including crochet, needle-felting and sewing. 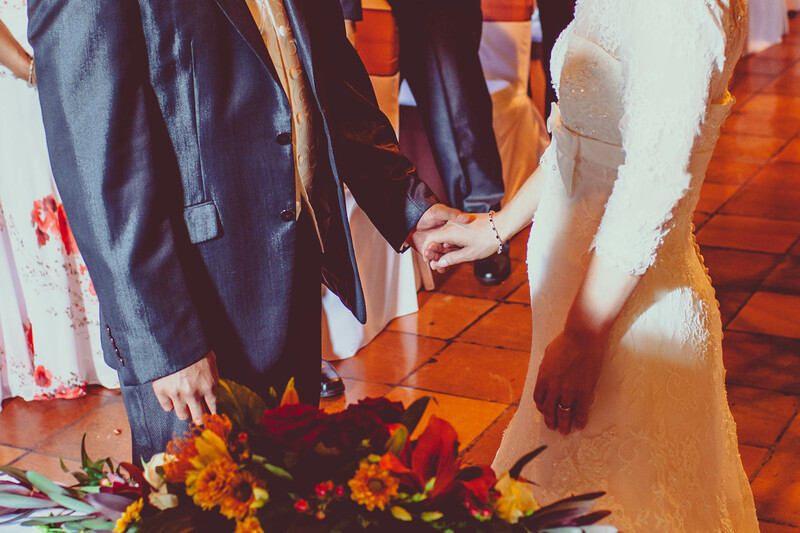 I love the simplicity of needlecrafts, taking a few simple materials and creating something beautiful out of them. I have to admit however to being quite a perfectionist (probably an understatement if I am honest) and whenever I take up a new craft I am not happy until I feel I have mastered it, a path which often starts with frustration and sore fingers but ultimately usually ends in happiness, satisfaction and hopefully beauty.